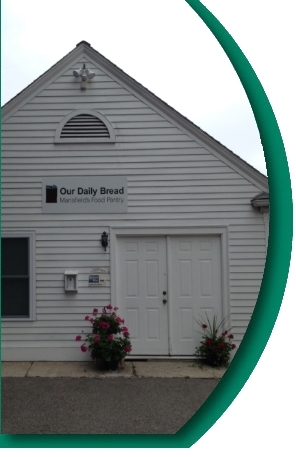 Mansfield's food pantry, Our Daily Bread: Friends Caring and Sharing, has been serving the Mansfield community since 1997 as an outreach project of The Congregational Church of Mansfield. We distribute food to Mansfield residents Saturday mornings between 9am and 11am. Grocery items are available to any Mansfield resident. Clients can 'shop' at the pantry for as long as needed. In 2015, more than 400 households representing almost 1000 people - families, senior adults, young couples and single parent households - visited the pantry and took home more than 16,000 bags of groceries. We are an all-volunteer run organization, and we rely on the generous support of local businesses and residents for both food and cash donations and to keep the pantry operating smoothly. Please consider giving or volunteering. The pantry is located at 15 West Street, next to the Congregational Church, and across from the South Common. Your tax deductible donation may be a gift to honor or remember a friend, family member, or loved one.